We started the day by visiting the outdoor market at Villa El Salvador to purchase decorations for the turkey dinner at Los Martincitos daycare center for the elderly. They wouldn’t let us take cameras since our being there at all made our local hosts very nervous. They say it is no place for gringos. The market is filled with an amazing array of meats, fish, vegetables and produce and it made me crazy that I couldn’t take any pictures. We returned with colored paper and vegetables to decorate the tables for the non-Peruvian feast. They can re-purpose the food items into tomorrow's meal so that it doesn't go to waste. After decorating, I scalded my fingers scooping the pulp out of a type of passion fruit that needs to be cooked before it is made into juice. I guess passion fruit juice goes with turkey! Tonight the cooks at our volunteer house served us a version of Thanksgiving dinner. 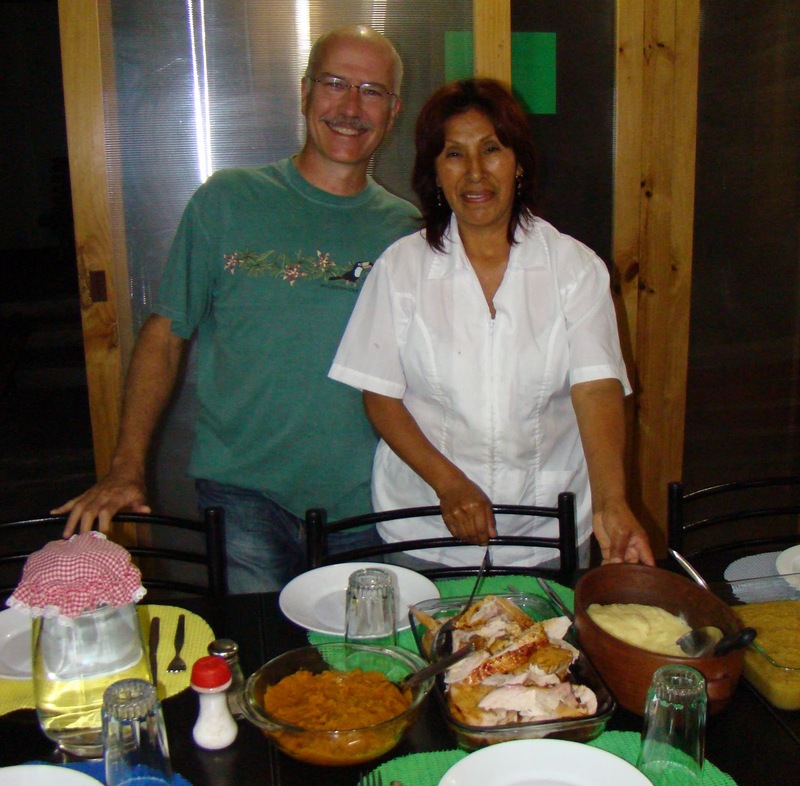 Luisa made us excellent turkey, mashed Peruvian potatoes, mashed sweet potatoes and homemade applesauce. Since I wasn’t expecting any Thanksgiving dinner at all, I didn’t mind that cranberry sauce and pumpkin are next to impossible to find in Peru. The pumpkin in the table decoration came from a secret location, not the market. Our time here is almost over and I am very thankful for the opportunity to vacation in Peru, especially the highlands, and then spend the last 10 days volunteering in Lima in a wonderful program providing good food and a lot of love to indigent and lonely elderly people who are abandoned or abused by their families. I have a lot to be thankful for! I'm so glad you are having such a good time! You guys are amazing. I'll bet that apple sauce (along with everything else, but I have a weakness for applesauce!) was perfect. Thanks for updating Judy! So wonderful to hear what a great time you are having! How sweet of Larry and Luisa to cook for you! Can't wait to hear more, hope I get the chance to visit there one day! Too bad you didn't get photos of the market, I bet it was beautiful! How sweet to be able to enjoy a real Thanksgiving feast even so far away. I bet that meant a lot. And I'm sure it's a meal you'll never forget. Happy holidays! Thanksgiving can be so many things when you can take it different places. At home is means different food and customs for people. Looks like a lot of fun. Hopefully no additional health scares.